Download "Life Insurance Company of the Southwest"
3 You need the security that comes with knowing you re protected regardless of where life s journey takes you. SecurePlus Provider was created with one thing in mind to provide you with options for life. 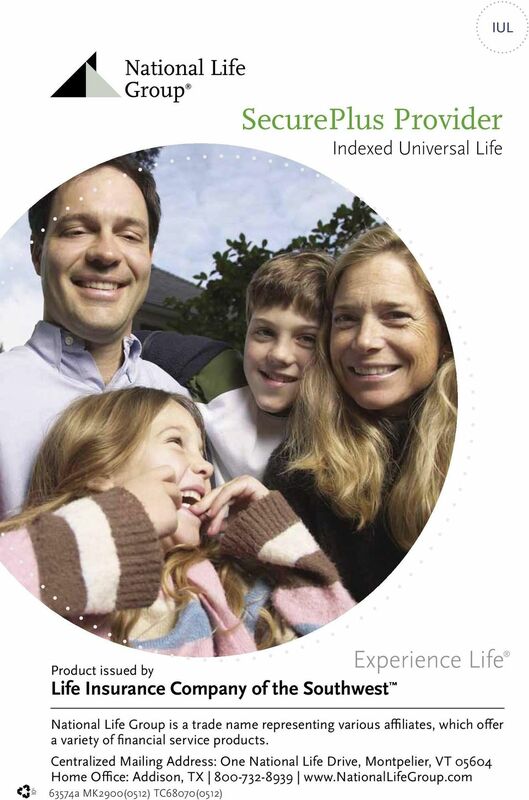 SecurePlus Provider from Life Insurance Company of the Southwest (LSW), is a flexible premium universal life policy with an indexed interest feature. With SecurePlus Provider, you can... 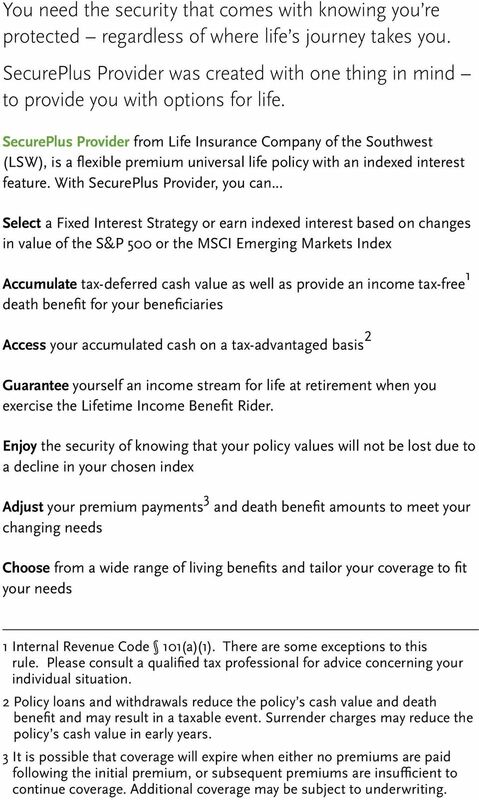 Select a Fixed Interest Strategy or earn indexed interest based on changes in value of the S&P 500 or the MSCI Emerging Markets Index Accumulate tax-deferred cash value as well as provide an income tax-free 1 death benefit for your beneficiaries Access your accumulated cash on a tax-advantaged basis 2 Guarantee yourself an income stream for life at retirement when you exercise the Lifetime Income Benefit Rider. Enjoy the security of knowing that your policy values will not be lost due to a decline in your chosen index Adjust your premium payments 3 and death benefit amounts to meet your changing needs Choose from a wide range of living benefits and tailor your coverage to fit your needs 1 Internal Revenue Code 101(a)(1). There are some exceptions to this rule. Please consult a qualified tax professional for advice concerning your individual situation. 2 Policy loans and withdrawals reduce the policy s cash value and death benefit and may result in a taxable event. Surrender charges may reduce the policy s cash value in early years. 3 It is possible that coverage will expire when either no premiums are paid following the initial premium, or subsequent premiums are insufficient to continue coverage. Additional coverage may be subject to underwriting. 4 SecurePlus Provider offers complete financial protection against life s greatest threats: Die too Soon Tax-free death benefit paid to beneficiaries at death to help cover expenses and make sure your family can maintain their standard of living. 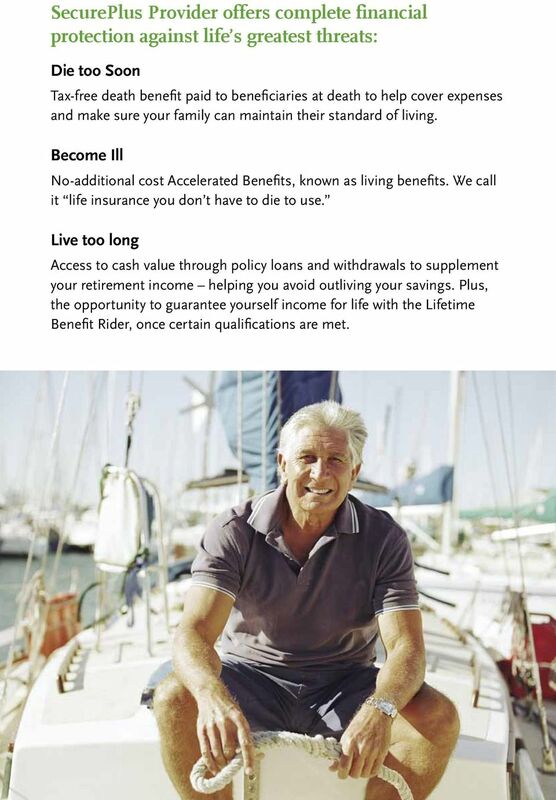 Become Ill No-additional cost Accelerated Benefits, known as living benefits. We call it life insurance you don t have to die to use. 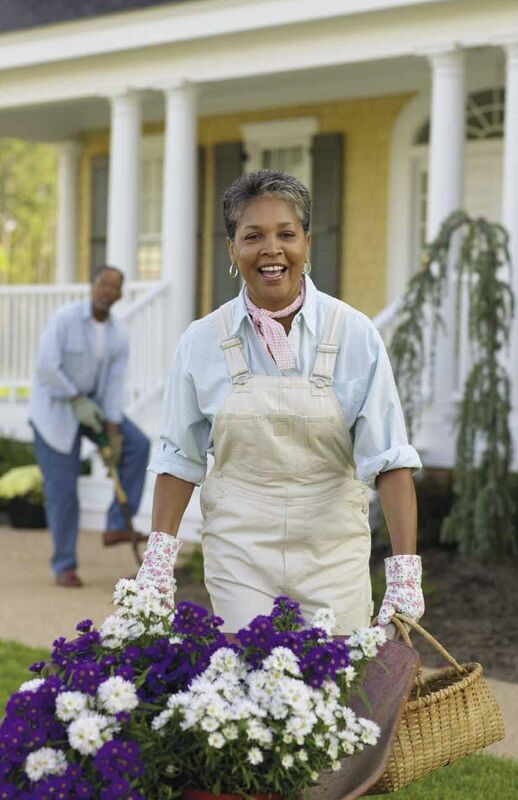 Live too long Access to cash value through policy loans and withdrawals to supplement your retirement income helping you avoid outliving your savings. 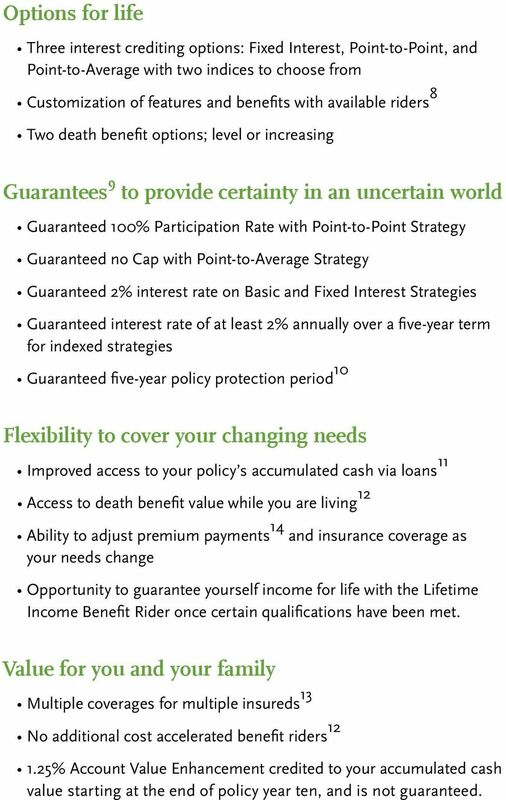 Plus, the opportunity to guarantee yourself income for life with the Lifetime Benefit Rider, once certain qualifications are met. 5 Living Benefits Valuable, No Additional Cost Accelerated Benefits Riders (ABR) 4 Medical conditions and illnesses, although not always fatal, can have a serious impact on your lifestyle, your ability to live independently and can deplete even substantial savings in fairly short order. Our no additional cost Accelerated Benefits Riders potentially provide a cost effective solution to these needs. If you qualify, you can access your policy s death benefit, while you are living, to cover expenses associated with a terminal, chronic, or critical illness. 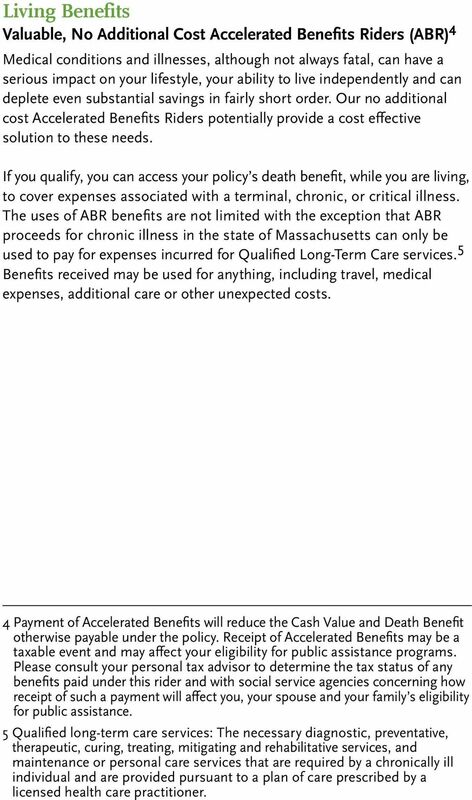 The uses of ABR benefits are not limited with the exception that ABR proceeds for chronic illness in the state of Massachusetts can only be used to pay for expenses incurred for Qualified Long-Term Care services. 5 Benefits received may be used for anything, including travel, medical expenses, additional care or other unexpected costs. 4 Payment of Accelerated Benefits will reduce the Cash Value and Death Benefit otherwise payable under the policy. Receipt of Accelerated Benefits may be a taxable event and may affect your eligibility for public assistance programs. Please consult your personal tax advisor to determine the tax status of any benefits paid under this rider and with social service agencies concerning how receipt of such a payment will affect you, your spouse and your family s eligibility for public assistance. 5 Qualified long-term care services: The necessary diagnostic, preventative, therapeutic, curing, treating, mitigating and rehabilitative services, and maintenance or personal care services that are required by a chronically ill individual and are provided pursuant to a plan of care prescribed by a licensed health care practitioner. 7 6 The Systematic Allocation Rider, form series 8985/ ICC (0911), available at no additional charge, allows you to use a lump sum or a 1035 exchange and spread the money out over a 12 month period. Once elected, your lump sum premium is placed into the Basic Account where policy costs will be deducted. From there, funds are swept from the Basic Account to the SA Account where each month, 1/12 is allocated to the chosen strategies. The remaining premium stays in the SA Account where it earns a fixed interest rate. Systematic Allocation allows you to spread out your lump sum over the 12 month period to capitalize on potential interest rate crediting dates and reduce interest rate risk associated with one annual crediting anniversary. Although the Systematic Allocation Rider may mitigate some risk, it does not guarantee higher returns than if the client were to pay a single sum premium without the rider. Simply put, it gives you a way to balance index fluctuations. It also gives you an efficient way to allocate a lump sum by allowing you to create one allocation schedule for the year without monthly maintenance. 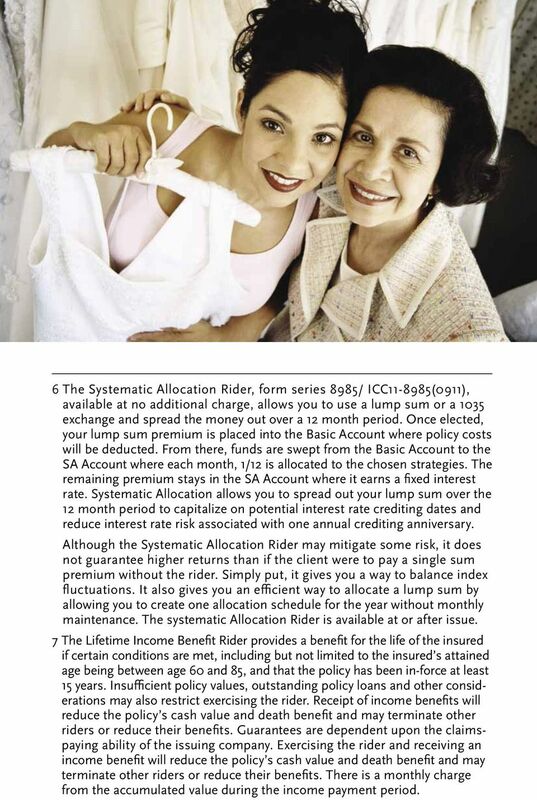 The systematic Allocation Rider is available at or after issue. 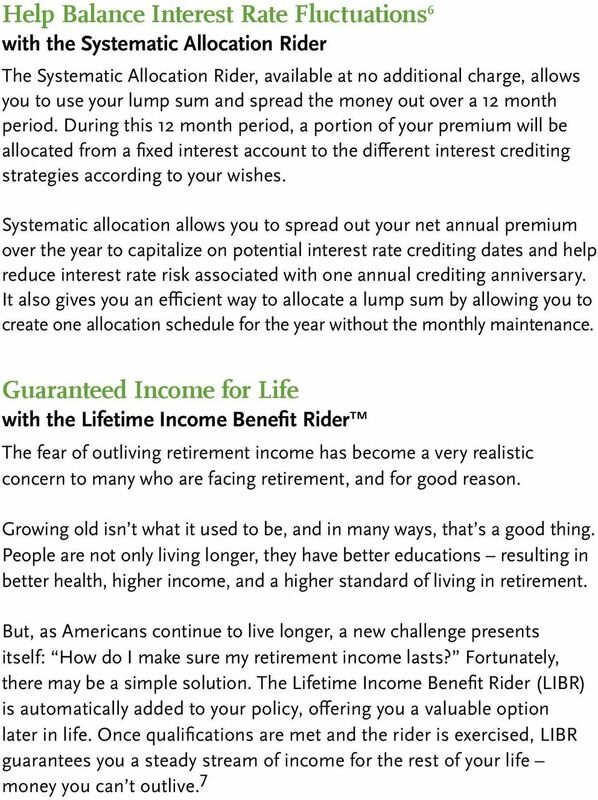 7 The Lifetime Income Benefit Rider provides a benefit for the life of the insured if certain conditions are met, including but not limited to the insured s attained age being between age 60 and 85, and that the policy has been in-force at least 15 years. Insufficient policy values, outstanding policy loans and other considerations may also restrict exercising the rider. Receipt of income benefits will reduce the policy s cash value and death benefit and may terminate other riders or reduce their benefits. Guarantees are dependent upon the claimspaying ability of the issuing company. Exercising the rider and receiving an income benefit will reduce the policy s cash value and death benefit and may terminate other riders or reduce their benefits. There is a monthly charge from the accumulated value during the income payment period. 8 Options for life Three interest crediting options: Fixed Interest, Point-to-Point, and Point-to-Average with two indices to choose from Customization of features and benefits with available riders 8 Two death benefit options; level or increasing Guarantees 9 to provide certainty in an uncertain world Guaranteed 100% Participation Rate with Point-to-Point Strategy Guaranteed no Cap with Point-to-Average Strategy Guaranteed 2% interest rate on Basic and Fixed Interest Strategies Guaranteed interest rate of at least 2% annually over a five-year term for indexed strategies Guaranteed five-year policy protection period 10 Flexibility to cover your changing needs Improved access to your policy s accumulated cash via loans 11 Access to death benefit value while you are living 12 Ability to adjust premium payments 14 and insurance coverage as your needs change Opportunity to guarantee yourself income for life with the Lifetime Income Benefit Rider once certain qualifications have been met. Value for you and your family Multiple coverages for multiple insureds 13 No additional cost accelerated benefit riders % Account Value Enhancement credited to your accumulated cash value starting at the end of policy year ten, and is not guaranteed. 9 8 Riders are optional, require an additional premium unless otherwise noted and may not be available in all states. 9 Guarantees are dependent upon the claims-paying ability of the insurer. 10 During the Policy Protection Period the payment of cumulative premiums, in excess of withdrawals and loans, at least equal to the Minimum Monthly Premiums payable since the effective date of the policy will keep the policy in force to the next monthly policy date, as long as the Accumulated Value is sufficient to provide for monthly deductions. Otherwise, the policy will remain in force as long as the Cash Surrender Value is sufficient to provide for monthly deductions. The policyholder may be foregoing the advantage of building significant cash value by paying only the Minimum Monthly Premium required to keep the policy in-force. At the end of the Policy Protection Period, if sufficient Accumulated Value has not been built up in the policy during the Policy Protection Period, payment of a premium significantly higher than the Minimum Monthly Premium may be required to keep the policy in force. 11 Policy loans and withdrawals reduce the policy s cash value and death benefit and may result in a taxable event. Surrender charges may reduce the policy s cash value in early years. 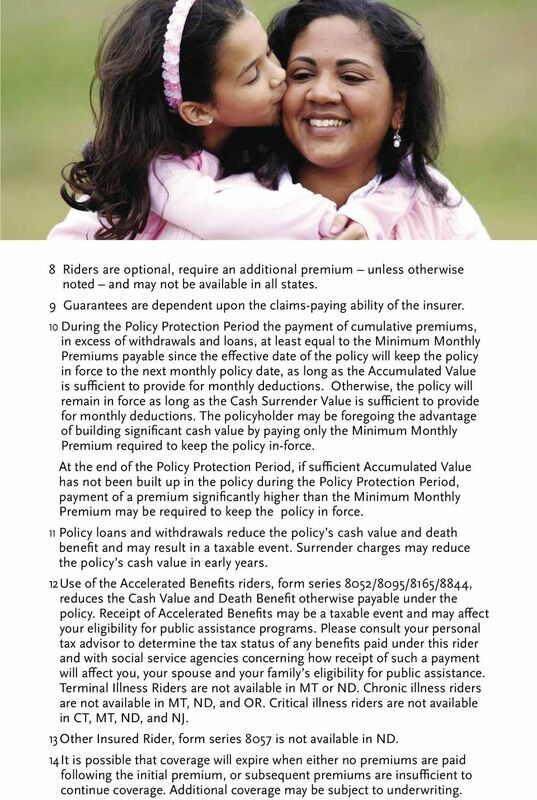 12 Use of the Accelerated Benefits riders, form series 8052/8095/8165/8844, reduces the Cash Value and Death Benefit otherwise payable under the policy. Receipt of Accelerated Benefits may be a taxable event and may affect your eligibility for public assistance programs. Please consult your personal tax advisor to determine the tax status of any benefits paid under this rider and with social service agencies concerning how receipt of such a payment will affect you, your spouse and your family s eligibility for public assistance. Terminal Illness Riders are not available in MT or ND. Chronic illness riders are not available in MT, ND, and OR. Critical illness riders are not available in CT, MT, ND, and NJ. 13 Other Insured Rider, form series 8057 is not available in ND. 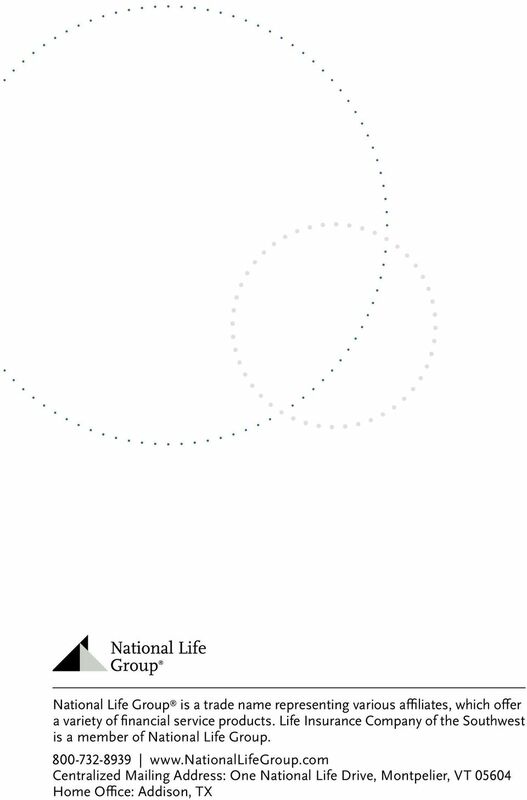 14 It is possible that coverage will expire when either no premiums are paid following the initial premium, or subsequent premiums are insufficient to continue coverage. Additional coverage may be subject to underwriting. 10 The Participation Rate is the maximum percentage of the annual increase in the Index that will be credited. For example: The one year increase in the Index is 10%. If the Participation Rate is 90%, then 9% would be used to calculate the interest credit [10% x 90%=9%]. The Cap is the maximum earnings percent that will be credited. For example: The Participation Rate is 100% and there is a Cap of 12%. If the one year increase in the Index is 14%, the earnings will be capped at 12%. Participation Rates and Caps are subject to change annually for a given indexed segment. 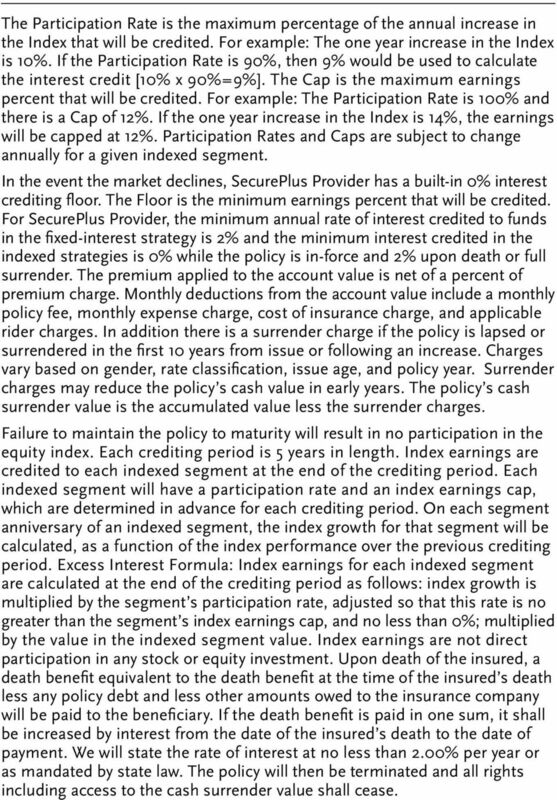 In the event the market declines, SecurePlus Provider has a built-in 0% interest crediting floor. The Floor is the minimum earnings percent that will be credited. For SecurePlus Provider, the minimum annual rate of interest credited to funds in the fixed-interest strategy is 2% and the minimum interest credited in the indexed strategies is 0% while the policy is in-force and 2% upon death or full surrender. The premium applied to the account value is net of a percent of premium charge. Monthly deductions from the account value include a monthly policy fee, monthly expense charge, cost of insurance charge, and applicable rider charges. In addition there is a surrender charge if the policy is lapsed or surrendered in the first 10 years from issue or following an increase. Charges vary based on gender, rate classification, issue age, and policy year. Surrender charges may reduce the policy s cash value in early years. The policy s cash surrender value is the accumulated value less the surrender charges. Failure to maintain the policy to maturity will result in no participation in the equity index. Each crediting period is 5 years in length. Index earnings are credited to each indexed segment at the end of the crediting period. Each indexed segment will have a participation rate and an index earnings cap, which are determined in advance for each crediting period. On each segment anniversary of an indexed segment, the index growth for that segment will be calculated, as a function of the index performance over the previous crediting period. Excess Interest Formula: Index earnings for each indexed segment are calculated at the end of the crediting period as follows: index growth is multiplied by the segment s participation rate, adjusted so that this rate is no greater than the segment s index earnings cap, and no less than 0%; multiplied by the value in the indexed segment value. Index earnings are not direct participation in any stock or equity investment. Upon death of the insured, a death benefit equivalent to the death benefit at the time of the insured s death less any policy debt and less other amounts owed to the insurance company will be paid to the beneficiary. If the death benefit is paid in one sum, it shall be increased by interest from the date of the insured s death to the date of payment. We will state the rate of interest at no less than 2.00% per year or as mandated by state law. The policy will then be terminated and all rights including access to the cash surrender value shall cease. 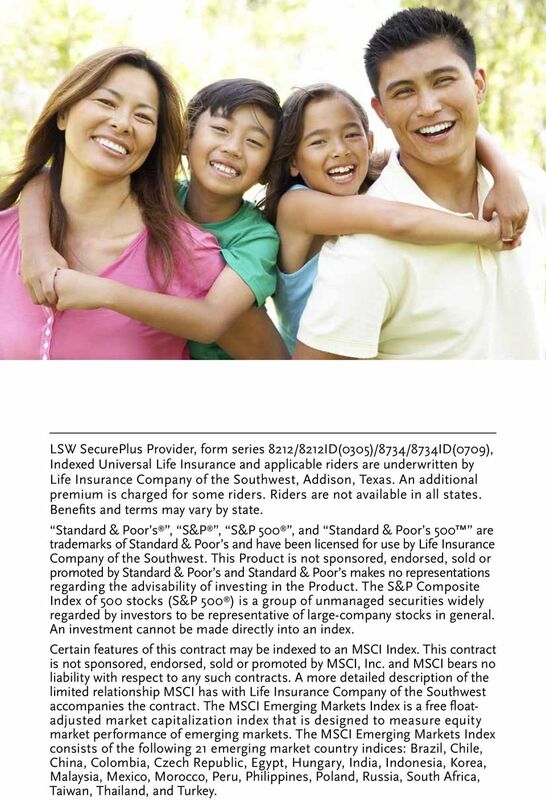 11 LSW SecurePlus Provider, form series 8212/8212ID(0305)/8734/8734ID(0709), Indexed Universal Life Insurance and applicable riders are underwritten by Life Insurance Company of the Southwest, Addison, Texas. An additional premium is charged for some riders. Riders are not available in all states. Benefits and terms may vary by state. Standard & Poor s, S&P, S&P 500, and Standard & Poor s 500 are trademarks of Standard & Poor s and have been licensed for use by Life Insurance Company of the Southwest. This Product is not sponsored, endorsed, sold or promoted by Standard & Poor s and Standard & Poor s makes no representations regarding the advisability of investing in the Product. The S&P Composite Index of 500 stocks (S&P 500 ) is a group of unmanaged securities widely regarded by investors to be representative of large-company stocks in general. An investment cannot be made directly into an index. Certain features of this contract may be indexed to an MSCI Index. This contract is not sponsored, endorsed, sold or promoted by MSCI, Inc. and MSCI bears no liability with respect to any such contracts. A more detailed description of the limited relationship MSCI has with Life Insurance Company of the Southwest accompanies the contract. The MSCI Emerging Markets Index is a free floatadjusted market capitalization index that is designed to measure equity market performance of emerging markets. The MSCI Emerging Markets Index consists of the following 21 emerging market country indices: Brazil, Chile, China, Colombia, Czech Republic, Egypt, Hungary, India, Indonesia, Korea, Malaysia, Mexico, Morocco, Peru, Philippines, Poland, Russia, South Africa, Taiwan, Thailand, and Turkey.